If we’ve learned anything from experience in Sanpete County, it’s that it takes public officials, community volunteers, creativity and perseverance to get a major community project off the ground. It has taken all of those things and more for Sanpete County and the Sanpete County Fairboard to get ready to put a new fairgrounds grandstand and arena out to bid. We’ve known for years that the current grandstand, at 95-plus years old, wasn’t adequate and wasn’t up to code. But it wasn’t until 2012 that Wade Anderson, then fair chairman, and Mike Bennett, vice chairman at the time, convinced the Sanpete Commission that something had to be done. The county applied for and received an $11,000 planning grant from the Utah Community Impact Board (CIB). The county hired Jones and Demille Engineering to evaluate the old grandstand and draft a fairgrounds master plan. Garrick Willden, senior engineer in engineering firm’s Manti office, confirmed that old grandstand was nearing the point of being unsafe. Then, under Fairboard direction, he drew up a master plan for the fairgrounds with an estimated price tag of $1.8 million. The plan called, first, for tearing down the old grandstand and using the current arena as a warmup area. It called for building a new arena, with a new, covered grandstand, north of the present one, with the grandstand facing south. The master plan also called for building a new concession building under the new grandstand, for remodeling one restroom and building three new ones, and for installing new sidewalks tying fair facilities and activities together. With Willden’s assistance, the Fairboard put together an application to the CIB. In late 2015, it was funded for $895,000, which at time, was the estimated cost of the grandstand only. That left the Fairboard, by then chaired by Bennett, with Matt Reber as co-chair, with an elephant to swallow. It was up to them to raise another $905,000 from foundations, business and private donations, to complete the $1.8 million budget. Bennett and Reber have literally scoured the county. And dozens of organizations, businesses and individuals have stepped up. The George S. and Dolores Dore Eccles Foundation committed $150,000, contingent on other fund raising. The Manti Ambulance Company had some money left over from constructing its new ambulance building. It gave $30,000. The Mormon Pioneer National Heritage Area, a partner in so many projects in Central Utah over the past 10 years, chipped in $30,000. Companies that have given amounts ranging from a few thousand to $40,000 include Zions Bank, Cache Valley Bank, Barclay Mechanical and Rocky Mountain Power. 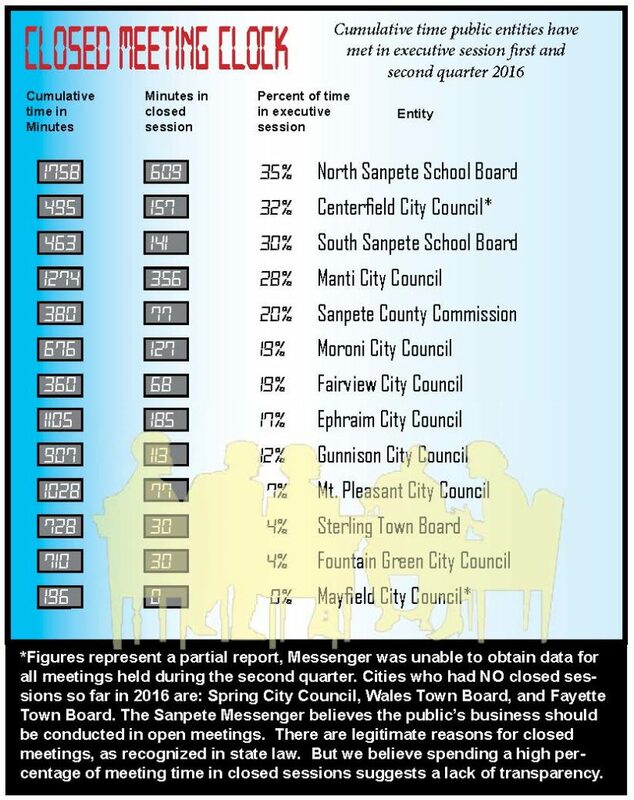 Municipalities that have pledged amounts ranging from $3,000 to $6,000 per town include Fairview, Ephraim, Fountain Green, Moroni, Gunnison, Centerfield and Mayfield have pledged amounts ranging from $3,000 to $6,000 per town. The result is that as of April 1, the Fairboard had $493,000 in private or in-kind donations pledged or in hand. 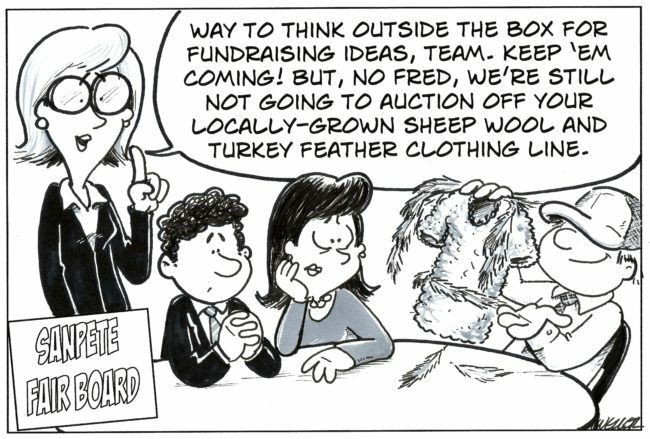 But when the Fairboard and county commission reviewed the project in March, there wasn’t enough money available to start work on the kind of stands the Fairboard wanted to build. So Bennett, Reber and others searched the Internet. They found a company in Minnesota that had deconstructed two NASCAR stadiums and were selling off the 12-year-old salvaged stands at bargain prices. The fair leaders negotiated purchase of enough materials from the Minnesota company to build a 3,750-seat grandstand. That’s more than three times the number of seats in the current grandstand. The deal included two smaller stands that could be placed on the opposite site of the arena containing another 3,000 seats. On top of that, the fair volunteers were able to purchase bleachers from the Minnesota company that could be placed on the sides of the arena containing another 2,500 seats. That will create approximately 9,500 seats. And the total cost was $457,000, a little more than half the original estimate for the main grandstand only. We commend Mike Bennett, Matt Reber, Garrick Willden, the Fairboard, present and former county commissioners, municipalities, businesses and individuals who have helped accomplish what many times over the past five years looked to be impossible. There is a chance the new grandstand will be ready for this year’s fair. But with extra design work required to adapt previous plans to the added seating, the facility may still be under construction during the 2017 fair. That means the fair may have to use the old grandstand for one final year. But the new stands and arena will definitely be in place by 2018. However, fairgrounds improvement can’t stop with the new arena. While it will take another two to three years, and while, if you can believe it, more money still needs to be raised, we urge all involved to persevere in order to complete the concession stand, restrooms, lighting, fencing, sidewalks and all elements in the original master plan. We’ve tried to fish. Now it’s time to cut bait. For years, Ephraim City has tried to work with multiple owners to get the now infamous Travel Inn at 330 N. Main torn down and something decent put in its place. Sometimes the city has struggled to simply locate the owner of the acre-plus property. But the 40-unit structure still stands, unboarded-up windows broken out, the disheveled contents of rooms abandoned 15 years ago still visible. Now the current owner, who has owned the property nearly two years, is asking for more delays and giving more ambiguous timelines. Everybody’s worn out. 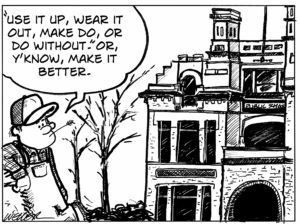 It’s time for the city to jump through whatever legal hoops it needs to in order to get the building condemned. Then the city, calling on volunteer help if needed, must take it down. Once the building is gone, the city could put a lien on the land in the amount of demolition costs. 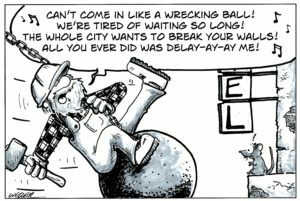 Consider a partial chronology, drawn from the archives of the Sanpete Messenger. In July, 2011, Olsen spoke out again. “This north end is pretty shabby coming in to our nice little town,” he said. The Messenger carried a large page 1 photo of the motel showing weeds 2 feet high. In July, 2015, City Planner Bryan Kimball told the city council he had good news: The blighted property had been sold at auction. Zions Bank had purchased it and resold it to Branden Kirk, a Spanish Fork realtor. And Kirk had asked for help from the city to tear the motel down. The city seemed to turn up the heat in 2016. The city council gave City Manager Hanson a deadline of Dec. 31, 2016 to get the building down. Police Chief Ron Rasmussen, whose duties include code enforcement, told the city council a couple of times that one way or other, the building was coming down. The city council set aside time at one of its meetings to hear from the public about blight in the city. One of the people who spoke was had been the city’s building inspector in time past. He had left to work as a building inspector on the Wasatch Front, then returned to Ephraim to retire. He said if he had been building inspector in Ephraim, the Travel Inn would have come down years ago. The city paid Sunrise Engineering to do an inspection of the property. Then the city staff and owner Branden Kirk said they needed three more months, until the end of March, to work out a solution. On March 15 of this year, Kirk visited the council to say he needed the city to approve a site plan for apartments on the site before he could do anything else. City Planner Kimball pointed out that site plan approval typically takes 6-8 weeks. Once he had an approved plan, the owner said, he would be able to seek investors in the project. And once he had financing, he could give a timeline for demolishing the motel. Wait a minute. The extended deadline for the building to come down was March 31. That’s tomorrow! If we don’t want that kind of thinking to become entrenched in the public consciousness. it’s time to cut bait. If there’s one volunteer group and one nonprofit effort that merits the praise of everybody in Sanpete County, it’s the Friends of Historic Spring City and their effort, running nearly 40 years, to save the old Spring City School. Most significant, the Friends have succeeded! From a flea market in the early 2000s that raised $8,000 to what appears likely to be a $100,000 appropriation from the current Utah Legislature, the Friends have raised $1.8 million. They are now completing restoration work and have scheduled a dedication during Spring City Heritage Day, which is always on Memorial Day. Built in 1899, the Spring City School originally consisted of eight elementary classrooms on two floors. The architect was Richard Watkins, who also designed the Spring City LDS Ward Chapel, the Piute County Courthouse and the Peteetneet Academy in Payson. In the 1950s, the school district ceased using it as a school. For a time, camper shells were manufactured in the building. In the late 1970s, the Daughters of the Utah Pioneers purchased it from the school district with the goal of saving it. When Craig Paulsen, a restoration contractor who is still heading up construction work, walked through the building about the time the DUP acquired it, he observed that the roof was about to collapse. The Friends of Historic Spring City hadn’t been organized at that point. But local people, including people who later joined the Friends, scraped together enough money to reshingle the roof and keep the water out. “For the first 20 years of the project, we just barely kept the building enclosed and standing with what money we could raise,” Paulsen recalls. In 2002, the Friends got one of the first serious infusions of cash when they got a $100,000 grant from the National Endowment for the Arts under the Save America’s Treasures program. To get the money, they had to match the grant. The organization came up with all kinds of creative ways to do that. They got local artists to donate paintings, which were sold on Heritage Day. They charged $5 to $10 for visitors to tour historic homes. Every fall, artists opened up their studios for tours, and visitors paid to poke their noses into the studios. Meanwhile, Yvonne Whitmore, who had grown up in Spring City and now lives in New York State, pledged $100,000 to the effort. And the organization got six $10,000 gifts, most individual gifts from its own members and some from corporations. The turning point came in 2012, when the Utah Community Impact Board (CIB) awarded a $323,000 grant and $323,000 loan to the city of Spring City for school restoration. The grant and loan came to $647,350 total. There were two catches. First, in order to get the grant, the city had to take out the loan as a show of local commitment. Second, the city council would only accept the loan if it was paid off, not by the city but by the Friends organization. She was right. The city council accepted the CIB money. Subsequently, the Friends got a $100,000 grant from the George S. and Dolores Eccles Foundation. The group needs to match that grant, just as it did the Save-America’s-Treasures grant. But the group may be able to use some of the money it expects to receive from the Legislature for the match. Lots of finishing touches need to be added before the dedication, which is a little more than two months away. We can’t wait for that event. We hope there will be an opportunity to give a standing ovation to people who made a commitment, never gave up and saved one of the most beautiful and historic structures in Sanpete County. Week 6, the last full week of the 2017 Legislative Session is in the books. Next Thursday at midnight will mark the end of the 2017 Legislative Session. At this point, we’re working to finalize the budget and complete the process of turning ideas into bills and turning those bills into law. Next week’s legislative schedule includes at least one more packed day of committee meetings, and three full days of up to 13 hours of debate on the Senate floor. Setting and balancing Utah’s budget is a very deliberative process. Weeks of study and consideration by appropriations subcommittees have lead to the passing of final budget requests on to the Executive Appropriations Committee. One of the proposed changes that will be considered is a 4 percent increase in Education funding. The Executive Appropriations Committee, which is made up of Senate and House leadership, will set the final budget for the upcoming year. Utah has a Constitutional requirement that we pass a balanced budget by midnight on the last day of session. That requirement, and our compliance with that mandate, has been the driving force behind the State’s high financial stability rankings for years. While the Executive Appropriations Committee is focused on how to best distribute funding for projects, I am involved with a few bills that will provide rural Utah with financial increase through jobs and programs. My Rural Jobs Act bill, SB267, would generate $37 million of private investments to rural Utah small businesses within three years. This is largely by avenue of investors and capital remains invested for at least six years. Currently, the poverty in rural Utah is 14.4 percent, roughly 3-4 percent higher than urban areas, largely due to unemployment. By bringing more small businesses, which typically create two-thirds of all new jobs, into rural Utah through enticing post-performance tax credits, this bill will create a minimum of 600 new jobs. This bill has already passed out of the Senate, and is awaiting debate on the House floor. Another bill awaiting debate in the House is my Oil and Gas Amendments, or SB191, which also focuses on revenue increase in rural Utah. This bill states that the Board of Oil, Gas, and Mining may make an order establishing a drilling unit or a pooling order retroactive under certain circumstances. This helps provide easier regulations for oil, gas, and mining companies, which will bring in job opportunities and income to our rural communities. The bill has passed the Senate Floor and is up for debate in the House. Lastly, the bill I am especially excited to share is my Utah Outdoor Recreation Grant, or SB264. This bill creates the State Transient Room Tax Act, in which the state shall impose a tax on hotel rooms at a rate of .32 percent in order to pour $5 million into Utah’s outdoor recreation projects. 70 percent of outdoor recreation project funding benefits rural Utah counties; therefore, this bill predominately benefits our own communities and parks. Included potential projects benefited by this funding includes the Moab River Road Trail, the Provo River Restoration Project, Parley’s Trail East, Outdoor Retailer Tents, Sandy City Dry Creek Trail, and several fantastic youth outdoor groups. This bill has already passed out of the Senate, and is awaiting debate on the House Floor. I have many other bills that I wish I could expound on for pages and pages. To save you the reading, I’ll stop my writing now. If you’d like to talk with me, you can reach out to my intern, Saren Winter, at (385) 441-0600 or at swinter@le.utah.gov. If you would like to promote or discourage a bill currently in the Utah Legislature, email me at rokerlund@le.utah.gov. As we approach the end of the session, I am grateful for the incredible sacrifices by our soldiers and leaders which allow us to debate society’s ideas in a civilized, free fashion. I am also touched by the constituents that have raised their voices in excitement or concern towards the legislature. Democracy is guarded by those who fight for our rights with either the gun or the pen. It is an honor to represent you – my colleagues, friends, and neighbors – in this legislative arena. The Utah Division of Wildlife Resources (DWR) has a big job. As outlined in various wildlife management plans, that job includes protecting, propagating, conserving and distributing wildlife populations in Utah. Because human activity can have a huge impact on wildlife, we all have a role in helping the DWR do its job. That’s why we support DWR’s temporary ban on antler gathering, along with public-private partnerships to protect and improve wildlife habitat, and, yes, common-sense limitations on off-highway vehicles (OHVs). Managing wildlife, primarily deer and elk, is a complicated thing. DWR has divided the state into 30 wildlife units. By putting radio collars on a random sample of animals, the agency estimates the number of deer and elk in each unit and continually updates the estimates. Then, based on biology, DWR figures out how many deer and elk each unit can sustain. Hearings are held to get public input before final population targets are set. From there, DWR regulates hunting with the twin goals of offering a good experience for hunters while working toward the population targets. Meanwhile, the agency works to stem trends that are deteriorating the wildlife habitat, such as sagebrush and cheat grass taking over rangeland that formerly had a variety of shrubs, and conifers taking over aspen forests. Since 2005, DWR, with partners such as federal agencies, private owners and nonprofit organizations such as the Rocky Mountain Elk Foundation, has treated more than 650,000 acres. Projects have included pinyon-juniper removal, controlled burns, reseeding after wildfires, conifer thinning and even leaving water guzzlers out in the wilds for use by cattle as well as deer, elk and other species. The numbers tell the tale of DWR’s success. In the nation as a whole, wildlife populations are declining. For instance, according to Deer Friendly, a research program at the University of Pennsylvania, from 2013 to 2014, the deer population in the United States dropped by 33 million. In Utah, the deer population today is, indeed, lower than 50 years ago. But since 1994, when DWR capped deer hunting licenses to stop decline of the herd, the deer population has grown an average of 1.6 percent per year. In 2013, it stood at about 355,000. The long-term permanent objective, which DWR wants to achieve by 2019, is 425,000. The biggest threats to deer and elk are habitat changes and harsh winter weather. The motivation behind the antler gathering ban was weather. Because of cold and deep snow, deer and elk are having a tough time finding food. The animals are under stress. In all seasons, one of the biggest issues DWR and other natural resource agencies are facing is OHVs. The DWR mule deer management plan says, “Uncontrolled use of motorized vehicles and OHVs can cause damage to mule deer habitat and disturbance to mule deer during critical phases of their life cycle” (mainly mating and fawning). The DWR, and state and federal land management agencies acknowledge the role OHVs play in giving people access to the beauties of the back country and even their role in hunting. But we support them in closing OHV routes or banning travel in areas where OHVs might damage wildlife. Wildlife is a wondrous thing. More than 100,000 Utahns per year participate in deer and elk hunts. Many others go into the back country to view and photograph wildlife. If we want these treasured experiences to continue to be available to our children and grandchildren, we need to support our Utah wildlife managers in protecting, managing and propagating wildlife. With Week 5 of the 2017 Legislative Session over, we are now more than two-thirds of the way done! We have passed a total of 163 bills and they just keep on coming. This week we were also honored to hear reports from Senator Orrin Hatch and Congresswoman Mia Love. I would like to share some of my bills currently awaiting debate on the Senate floor. One of them is SB204, or my Public Private Partnerships bill. This bill expands and allows the use of public-private partnerships in the procurement of projects. It allows more project sponsorship by 3rd party companies, and helps reduce required government budget appropriations. Another bill of mine awaiting Senate debate is an Outdoor Recreation Grant, or SB264. This bill creates the State Transient Room Tax Act, which slightly increases tourist taxes in order to pour more money into Utah’s outdoor recreation projects. This tourist tax has been in the works since early January, and is predominately a hotel tax. Because the standard guest to a Utah-based hotel is local to a different state (i.e. Colorado, Nevada, Arizona), the tax will largely not affect Utah residents. Readers who have plans to stay in a local Utah hotel need not fret either; the tax increase is extremely minor, and will hardly add to your bill. One current issue in the legislature is online sales tax. In Utah, our legislative fiscal analysts have estimated that around $220 million of owed sales tax go unpaid because of online purchases. While Utahns are currently required to pay sales tax for their online purchases, fewer than two-percent actually pay their owed tax. That is $220 million that we could be spending on education, infrastructure, and social services. Because online retailers are not required to collect the owed sales tax, this also creates an unfair advantage to online retailers, and makes it difficult for our local, brick-and-mortar businesses to thrive. 1SB110 would balance the playing field and help collect the owed tax. This bill would require retailers who earn over $100,000 of sales in Utah to begin collecting sales tax. For an affiliate, the threshold is $10,000 of sales in Utah before they are required to collect sales tax. This bill passed out of the Senate this week and will now be considered by the House. Once again, this is a shorter letter than usual. I hardly have a full report to share, largely because we didn’t have a full work week in the Senate. I’m hoping that everyone took advantage of last week’s President’s Day, and that your days aren’t as busy as mine. Keep sending emails concerning Senate or House bills that excite or concern you. These emails have many times helped me identify potential problems and solutions to Utah’s top issues. If you’d like to meet with me, you can reach out to my intern, Saren Winter, at (335) 441-0600. You can also email her at swinter@le.utah.gov. It is an honor to represent you- my neighbors, my colleagues, my family, and my friends. With Week Four of the 2017 Legislative Session over, we are now more than halfway done! We have passed a total of 96 bills, and they just keep on coming. Some of the bills have caught significant attention, often because they are considered controversial. Allow me to discuss some of these hot topic bills. The Utah Legislature is considering dissolving partisan requirements in government. Currently, many state boards and commissions in Utah require there be no more than a certain number of members that belong to the same political party (e.g. seven members only). Originally, these requirements were meant to ensure the boards contained multiple different opinions. In practice, however, these partisan requirements have created staffing problems. There are many instances in Utah where a town contains almost entirely Republican or entirely Democrat civilians. This means for instance, a local Radiation Control Board cannot be staffed by enough doctors because they filled up their party member quota, and cannot fill the opposite party affiliation slots. Furthermore, what happens when the only qualified doctor—who also happens to have the necessary partisan affiliation—lives in St. George and must commute to Salt Lake City to serve on the Board? This bill, HB11, solves this problem by eliminating all references to partisan affiliation. Under this bill, neither the Governor nor the Senate is allowed to even consider partisan affiliation as a prerequisite to service on a board. The purpose is to make quality the determining factor, not partisanship. Another hot topic bill concerns Utah school grading. Over the last few years, we have worked on how to improve our school assessment and accountability systems. We want to ensure that these school systems are helping our students learn and grow— not just placing overwhelming burdens of tests and grading. SB 220 seeks to reach the next level in school assessment and accountability by switching over from SAGE to ACT. We hope to establish a single meaningful statewide report of school performance. ACT uses multiple indicators that are focused on student-level outcomes, and also seeks collaboration with the State Board of Education and other stakeholders. SB 220 hopes to leave normative school grading and bell curves behind, and instead establish set criteria for attaining each grade level. This bill has only begun the legislative process, and will be appearing soon on the Senate floor. This week, our appropriation subcommittee chairs presented priority appropriation requests they want funded to the Executive Appropriations Committee (EAC). These priorities are shared in hopes that the EAC will fund the priorities in the general budget. If you are following a certain budget appropriation request, know that we are closer to hearing the funding results of our appropriation request presentations. Lastly, I want to speak on the resolution causing the largest debate in the legislature currently: HJR 3. This resolution calls for Utah to join other states in petitioning Congress to create a Convention of the States. At this convention, states would consider amendments to the US Constitution, in order to limit the power and jurisdiction of the federal government. This concept has been debated for many years in almost all of the state legislatures in our country. As the resolution has been presented in both the House and Senate committees, members of the public have come to speak passionately on both sides of the issue. Most all of them are in agreement that the federal government has grown beyond the original intentions of the Founding Fathers. Those who oppose the proposed Convention of the States have brought up that this kind of convention has never been successfully implemented. In their eyes, there are too many unknowns and possibilities. Some believe that the chance of a “runaway” convention is too high, that there is nothing to keep nefarious delegates from proposing changes that will ultimately take away freedoms guaranteed in the constitution. I and many of those in favor of a Convention of the States believe that the only fear should be our federal government growing unchecked. I contend that fears of a “runaway” convention are unfounded. In order for that to happen, 38 of the 50 states would have to agree to changes instituted in a “runaway” convention, and I believe that state legislators are more worthy of trust than our current US Congress. HJR3 has passed out of both House and Senate Committees and the House Floor. Its next stop will be the Floor of the Senate for continued debate. That’s it for our current hot topic bills. You are welcome to join me at the Capitol any time this session, whether it be to watch voting in the 4th floor House and Senate galleries, or to share your concerns in a face-to-face meeting. If you don’t have time to come up to Salt Lake City, all floor activity in the Utah Senate Chamber is broadcasted at senate.utah.gov/webcam.html. Hearing your voice helps me accomplish my job to represent you. I can be reached by email at rokerlund@le.utah.gov. If you’d like to meet with me, you can reach out to my intern, Saren Winter, by email at swinter@le.utah.gov or by phone at (335) 441-0600. I hope to hear from you as the legislative session wraps up. I’m starting to get a little homesick, and I’m not much of a city kind of guy. I would love to see some fellow rural Utah faces this next week. Question we need to ask about Justice Reinvestment Initiative: Where’s the beef? That’s the question all of us ought to be asking about the Justice Reinvestment Initiative (JRI). JRI began in 2015 when, with plenty of fanfare, the Utah Legislature passed HB348. The idea was to stem the growth of the prison population by using prison for serious and violent offenders. At the time HB348 passed, there was talk of money, including funding that was going to be channeled through the Utah Division of Substance Abuse and Mental Health for drug and alcohol treatment for offenders. We can say that 15 years ago when someone was arrested for drugs in Sanpete County, the person was sentenced, typically to fines and probation, and sent on his or her merry way with no mention of treatment. Today, things are different, more because of county actions than JRI. Sanpete County now has a deputy sheriff working as a county probation officer with certain drug and alcohol offenders. His case load is 55 people. With his support, some of his clients are racking up some significant clean time. On its own, the county obtained a $65,000 federal grant, then added $16,000 in county funds, to create an addiction treatment program in jail. To participate, an inmate must expect to spend at least 90 days in jail, either before sentencing, in the form of a sentence, or through a combination of both. The majority of people spending that kind of time in the Sanpete County Jail on drug-related or alcohol-related charges are participating in the program. Our county prosecutor, public defender and law enforcement leaders all say the fairly intensive program is making a difference for many participants. But to put it all in perspective, consider that about 500 people per year are booked into the Sanpete County Jail on drug or alcohol charges. Still others never go to jail. They receive citations and are adjudicated in municipal justice courts. At best, the county programs are reaching 25 percent of our citizens who need help with substance abuse. One feature of HB348 was reducing sentences for drug crimes. A person now has to be arrested at least twice, in some cases three times, before a drug offense becomes a felony. Even then, the highest charge for simple possession is a third-degree felony. Very few people go to prison for third-degree felonies. The results is that the Sanpete County Jail, and undoubtedly other county jails, are filling up with drug offenders. But the counties have no additional funds to cover the costs of local incarceration. At the state level, under the umbrella of JRI, a lot of money has gone into writing rules; offering sentence reductions to people already in prison for completing programs that existed in the prisons before JRI was launched; writing standards for drug screening and treatment (as opposed to paying for treatment); and certifying treatment programs that existed before HB348 was passed,; not to mention paying PhDs to write annual reports on JRI. We have to ask how many people could have been put into treatment programs, housing or jobs with the funds expended on regulatory and administrative work. 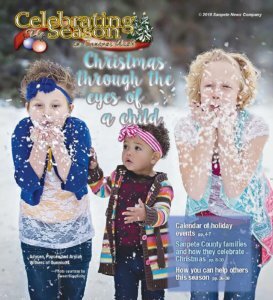 What lawmakers and state bureaucrats don’t fully grasp is that in Sanpete County, and surely in other rural counties, there are no community-based treatment programs that drug offenders can afford, there are no unskilled jobs that pay enough to cover basic living costs, and often the only support networks are the drug friends the offenders had before they got caught. Too often, release back to the community means going back to “couch cruising” at those friends’ houses or apartment. We call on the governor, Utah Legislature, Utah Department of Corrections and Utah Division of Substance Abuse and Mental Health to put some beef in JRI. Or, to borrow a line often used in 12-Step group meetings, it’s time for the state to start walking the talk. Week two of the 2017 Legislative Session is in the books. A total of 11 bills have passed through the entire legislature but committee agendas and reading calendars are filling up with bills in a hurry. Overall, we have had a productive and busy week. While the media has focused on issues like the Bears Ears and Escalante Grand Staircase Resolutions, there have been many other issues and bills discussed by the legislature. My concurrent resolution to recognize local snow removal crews is presently underway. On Jan. 13, 2017, Terry Jacobson, a UDOT snow removal crewman, suffered a collision by a semi that sent his plow truck crashing down a 300-foot embankment. Because of this, the Utah Legislature is moving quickly to highlight, as well as appreciate, the dangerous work our snow fighters undergo in order to provide safe roads and an improved quality of living. Snow removal crews have already driven over 2.7 million miles of road in the process of their work, often amidst the worst weather Utah has to offer. As the sponsor for this resolution, I am working to guarantee their labor does not go unnoticed. This resolution received enthusiastic reception in the Senate Committee recently, and will reach the Senate Floor this coming Friday. This week, the House debated a resolution that calls on President Trump to overturn President Obama’s Bears Ears decision. The resolution sharply criticizes President Obama for using the Antiquities Act—which was designed to help protect Native American structures and objects—to set aside 1.5 million acres of Utah land for environmental protection. Among other things, the resolution chides Obama for ignoring the wishes of the residents of San Juan County-many of whom are Native American. This resolution passed the House and will now be heard by the Senate. We are beginning the process of pushing new bills in order to encourage rural economic development. I am in the early stages of creating an Outdoor Grant, which will ensure available funding for regional service centers for education providers throughout my district. Education has been a top concern to Utah according to recent local surveys, therefore I desire, by the end of this legislative session, that this appropriation request will bring more resources to our students and schools. Further bill information is publicly available on our website le.utah.gov, where we provide live online streaming for each of our committees, Senate Floor discussions, and House Floor activities as well. Connect specifically with the Utah Senate for updates wherever you live on social media by visiting www.senatecloud.com. We’re on Facebook, Twitter, LinkedIn, Instagram, Pinterest, and all sorts of other sites. Feel free to visit our new website for updates, articles, and information: www.senatesite.com. You can connect to me personally online through my email at rokerlund@le.utah.gov, or by phone at (435) 979-7077. If you would like to meet with me, you can reach out to my intern, Saren Winter, at (335) 441-0600 or via email at swinter@le.utah.gov. You are welcome to join me at the Capitol any time this session – you would be a welcome guest. As we dive further into the 2017 Legislative Session, I am mindful of the incredible sacrifices by so many which allow us to debate society’s ideas in a civilized, free fashion. It is an honor to represent you – my colleagues, friends, and neighbors – in such an arena. Amongst the many concerns and pressures felt by the legislators this General Session, our priority is this: By 2025, it is estimated that the entire civilian population in Utah will double, and the state government must prepare for that increase. One of the important ways to do so is through strengthening our state’s public education. Despite Utah being fifth in the nation for percentage of our state budget spent on education, we must improve funding for our teachers, our school programs, and our children. These kids are the future of Utah, and we must treat them as such. Among other preparations we will need to focus on, our eyes are on Utah’s water supplies, transportation, fuel and power, and pollution reduction. There is also reasonable concern for the slow economic development of our rural communities. This legislative session, I am working to provide coordination opportunities between private and public entities to create job opportunities and overall economic stimulation. I desire that the people of rural Utah will have success in supporting their families and overall well-being through work opportunities and business growth. We will be watching closely what happens with the new Trump administration this year. With his inauguration so fresh, we have yet to comprehend what relation this administration will have with Utah and its policies. Until then, your state legislatures will do all they can to respond to the needs of our communities, and pass laws to assist with our expanding state. Gunnison City and Centerfield City have set a good example for the rest of the county with the finalization of their interlocal policing agreement, which effectively unifies their two police forces to create the Gunnison Valley Police Department (GVPD). The unified Gunnison Valley Fire Department and its accompanying $1.4 million fire station is model of valleywide cooperation, with every community, including unincorporated Axtell, helping pay off Utah Community Impact Board (CIB) bonds used to build the fire station. As the Messenger covered development of the policing agreement, we witnessed the challenges elected officials faced and overcame. We saw the looks of frustration on the officials’ faces when things didn’t go smoothly. Some of the officials, such former Gunnison City police chief Blane Jensen, have been pushing for a unified force for nearly two decades. What matters now, though, is that the first round of unification has been achieved. Jensen and McCall were directly involved in the drafting of the agreement, along with Gunnison City Attorney Mandy Larsen and Centerfield City Attorney Steve Styler. The city council and mayors from both municipalities weighed in throughout the process, offering their opinions, advice and majority votes to move the agreement forward. Public hearings were held to gather feedback from residents of each community. The officials did not falter when Mayfield residents voted not to participate (much to the chagrin of Mayor John Christensen) because they preferred to save a few bucks in the short-term. Just when everything looked like it was a done deal, a new variable surfaced when Gunnison City’ Police Chief Trent Halliday was diagnosed with cancer. (Another example of the Gunnison Valley spirit of cooperation can be found in our front page story about the Refuse-to- Lose, Trent-Halliday benefit.) In the face of uncertainty, the authors of the agreement kept moving forward. Although the unification agreement has been approved by both the Gunnison and Centerfield city councils, there is a lot of work ahead. That includes forming the GVPD governing board, adopting policies, selecting a chief, hiring new officers and, most importantly, maintaining the support of residents. Looking out to the horizon, we hope that in time, the other communities in the valley will join in the operation. A single police force with an adequate number of officers policing the whole valley makes imminently more sense than a two-city force supplemented by sheriff’s deputies driving from Manti, or wherever they happen to be in the county when a call comes in. Meanwhile, kudos to Blane Jensen, Brett McCall, the city attorneys and the two city councils for taking the vital first step. And best of luck to them in the work now in front of them. A swimming pool is a great community resource, but it doesn’t pay for itself. Leaders and citizens in Mt. Pleasant’s leadership have been working for 20 years to bring a swimming pool to their community. It’s finally going to happen. But now the community has come to a fork in the road in terms of aquatic center operations. Proposition 7, a proposal on the election ballot, would add a 2.25 percent “local charge” to Mt. Pleasant electric bills and Questar natural gas bills charged within the city. If it passes, it would enable the center to operate year-round basis. Defeat of the proposition means the pool will be open in the summer only. There’s another important consideration. If the pool stays open year-round so Wasatch Academy students can use it, the school has agreed to give the city $30,000 per year. The city wants to use money to make payments on a $1 million loan from Utah Community Impact Board for aquatic center construction. If Proposition 7 fails, the pool won’t be able to stay open through the school year, and the Wasatch contribution will be lost. The city council put Proposition 7 on the ballot so residents can decide for themselves if it’s worth shelling out cash to be able to enjoy a swimming pool year round. In this case, the cash only adds up to an extra $1.67 per month on the average Mt. Pleasant electric bill and $1.80 per month on the average Questar natural gas bill, according to Monte Bona of the Aquatic Center Committee. Is having an indoor swimming pool open and heated year round worth approximately $41.64 in extra fees on the utility bills? We sure think so. Municipal swimming pools do not make profits. Look at Gunnison Valley’s pool. Because of the draw the pool was making on other city resources, the city had to close the doors, appoint a committee to study the operation in depth and bring in new management. With a serious volunteer effort, and resourceful ideas from manager Kevin Havey, the city reopened the pool and is now working on adding a splash pad next to it. If Mt. Pleasant wants an aquatic center that their citizens will value and patronize the way Gunnison Valley does its pool, Mt. Pleasant is going to have to subsidize the operation. Sure, the new aquatic center could operate during the warmer months only. But then a beautiful building with a heated pool would lay dormant and useless the remainder of the year. Think of all the months when senior citizens could engage in water therapy, high school swim teams could practice, and children could swim and dive to their hearts’ content. Think of what your $41.64 per year could mean. We think it’s a contribution worth making, because in making it, you’re making your city a better place. 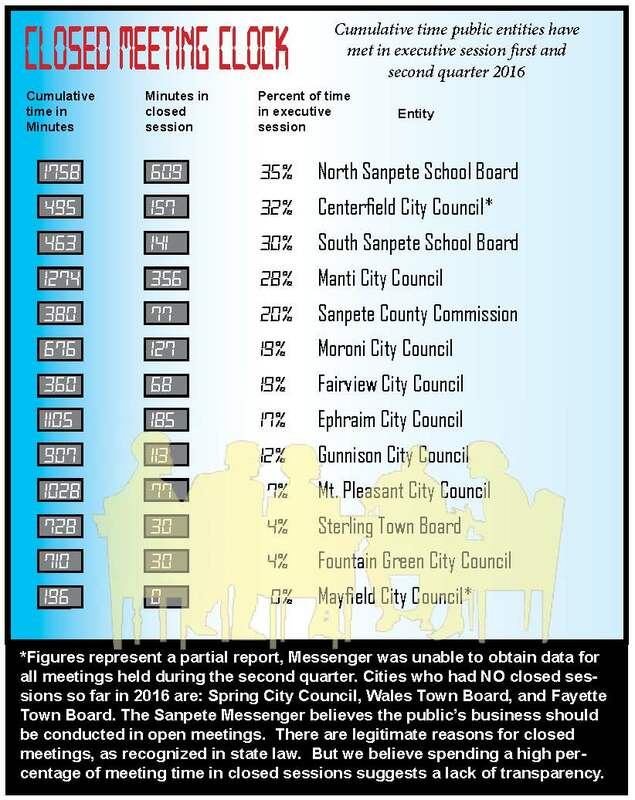 This clock gives you a glimpse at how much time the governing bodies in Sanpete County’s municipalities spend in closed session. Click to expand image.